Lightweight and soft brace features base sleeve with Mueller's exclusive moisture-wicking HYDRACINN fabric which is latex-free and neoprene-free. Lightweight and soft brace features base sleeve with Mueller &apos;s exclusive moisture-wicking HYDRACINN fabric which is latex-free and neoprene-free. Permanently bonded antimicrobial barrier provides protection against odor causing bacteria, fungus and other microorganisms. Two sets of flexible steel springs over the top and bottom of wrist provide double protection and firm support. 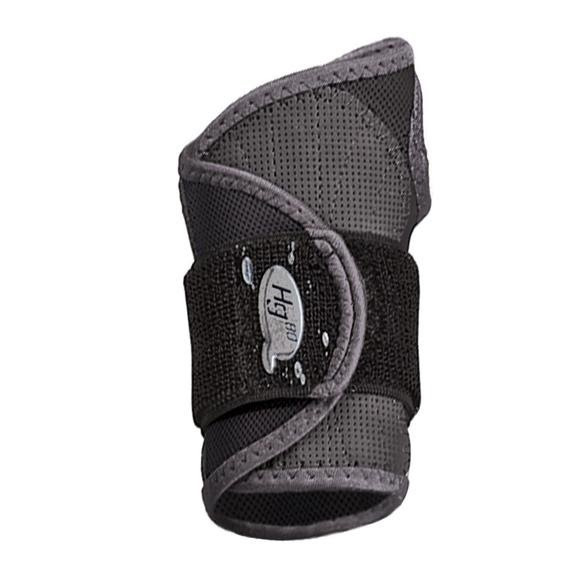 Base sleeve has a stretch panel to allow easy positioning while the adjustable outer tension strap secures brace in place for a comfortable fit. Allows full finger and thumb movement. Includes free nylon mesh laundry bag to shield clothing from hook & loop straps in gym bag or washing machine.